Are you planning to give any DIY gifts this year? 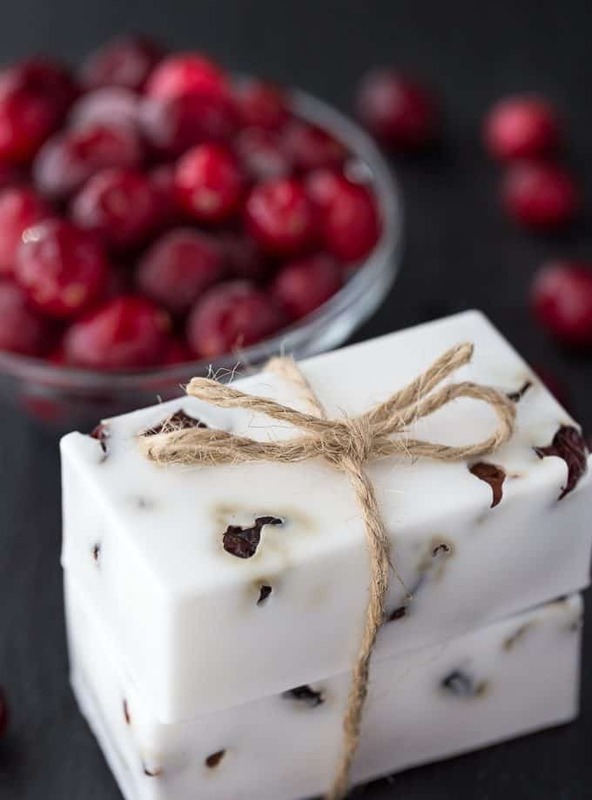 If so, try this Cranberry Vanilla Shea Butter Soap, an easy homemade soap recipe perfect for gift giving! It has a bit of a holiday feel with the inclusion of dried cranberries. I added some vanilla soap fragrance to give it a soft, pretty scent. 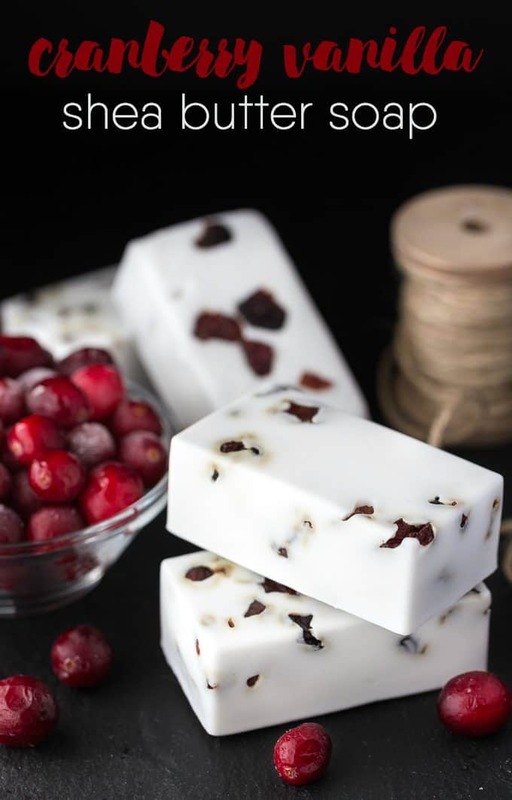 The dried cranberries will make the soap last longer than if you used fresh. Cover the bottom of your soap mold with dried cranberries. Add shea butter soap base to a microwaveable bowl. Microwave on high for 30 seconds, and then stir. Microwave an additional 10 seconds and stir. Continue to microwave in 10-second increments, stirring in between, until the soap is completely melted. Stir in vanilla soap fragrance. Pour into soap mold. Let sit at room temperature until set (about 40 minutes to 1 hour). Carefully remove from soap mold by pushing on the bottom to release the soap. You’ll need to pick up a few supplies to make this soap. Then you’ll also be able to make my other DIY soap recipes too. I love making my own soap. It’s so simple. Do you have anyone on your holiday shopping list who would love this soap? Would be nice to make this to give as gifts for the holidays. I really need to get some soap making supplies. 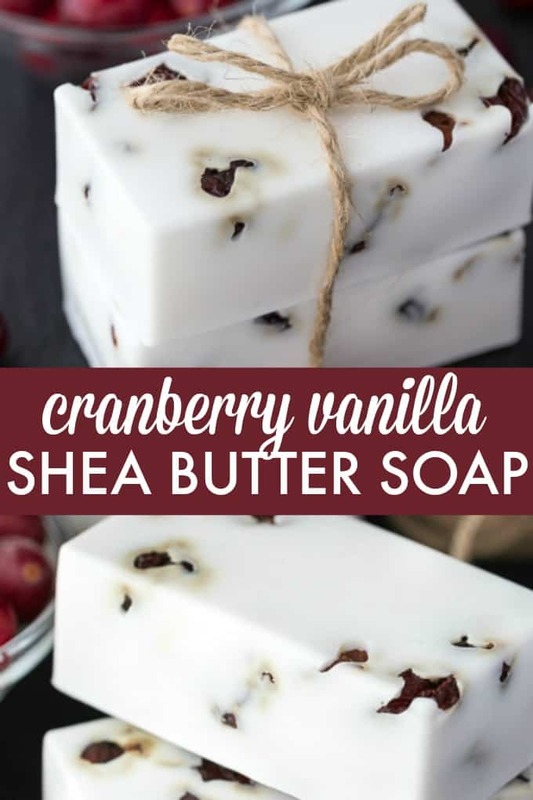 I have never made my own soap, but the Cranberry Vanilla combination sounds just good enough to make me try! It’s important to note that when using a vanilla fragrance oil that your soap will turn brown unless you use a vanilla stabilizer. I will try this one. Thanks for posting. Wow!! This scent would be heavenly. Pinned to save. I think this would be an excellent gift for Mother’s Day this year! Thanks for sharing Stacie!! I’ll bet that smells amazing! I love homemade soap and want to make it badly- if I ever get more than ten minutes to myself! This is pampering at it’s very best Stacie. The shea butter, vanilla and cranberries combination sounds both soothing and so heavenly. I know this isn’t really important when it comes to soap but these bars are sooo pretty! I love the look of them. I would love to make these to set out for company. Thanks for the recipe! I’ve always wanted to try my hand at soap making. This recipe sounds easy enough for a beginner like me and it’s pretty too. Thanks for sharing on Merry Monday. Stacie, you always make such beautiful soaps! I have to make my own one day. May I ask, what do you do with all these soap bars?! You don’t keep them all, do you? I wouldn’t even have enough friends to give all of those soaps away as gifts 😀 Looking forward to your next post! I keep some and I also give them to my cousin and she brings them to work! I would love to make this for Christmas gifts. What size mold did you use and how many bars of soap did it yield? I used this mold: http://amzn.to/2y0hvJT and it made 4 bars. Someone mentioned a vanilla stabilizer or the soap would turn brown. Is this necessary? Is this soap for the shower? I’m concerned with the cranberries clogging my drain. If you are worried, I would just use it in the bath. It is true that if you use any Fragrance Oil in it that has Vanilla, the soap will eventually turn brown. If you do not want to use a Vanilla Stabilizer, I would suggest a different fragrance. For many new soapers they do not know this. Some I do not mind turning brown, if they go with the flow of the design, so these will start to look like little cakes with cranberry in them. Some suggested fragrances would be Lavender, Cranberry Salsa or any that say no vanillin content ..hope that helps. I used this for my Christmas gifts this year! Wicked easy to make and it smells amazing. I ran out of clear vanilla fragrance so I added a bit of vanilla extract. The only thing that happened was that it turned the soap slightly brown but not completely. It looks kind of artsy to me. Thanks for sharing! !